There are plans for additional elements to be produced for the Kickstarter - these include exciting pieces like an alternative fortified gate, watchtower and ladders and further walkways. As with the other Fogu kits I've worked with, the detail is second to none, with beautiful crisp casts of different metal, brick and wood textures. Each section is also unique - there are no duplicates casts in the set I was provided. The gateway is wide enough for a small vehicle, and the space inside the fort could be filled with trade goods or even small shelters. I particularly like how the gate section has been reinforced with girders driven into the ground. The gate itself works on a simple hinge mechanism and can be opened and closed. I painted this set up to match the colours from my earlier Fogou shack. I went for a rusty brown across much of the set, livened up with yellow, blue and grey panels (all of course given a healthy dose of weathering). I added a few scrawled slogans and some stencilled numbers and letters to add interest. The wood was all painted to look like it had been sunbleached, and then I gave the entire fort a drybrush with a dark tan. Playing around with layouts could give you a defensive line across the board, or perhaps a section of a fortified wall from a much larger settlement. I've been meaning to get round to painting up a few other Fogou shacks I still have, and was playing around a few days ago to see how they could be incorporated into the fort. I figure I can insert some into the wall sections and give me more interior space to put some shacks inside the fort for a proper scrap town! I can't wait to add to this set - keep an eye out for the Kickstarter so you can pick up one of your own. I aspire to be good enough to be sent stuff by companies of their calibre! Fogou are one of those companies that I'd be all over if money wasn't an object - as it is I keep using them as inspiration in the trash-based terrain that I make for the table-top. Fogou stuff is great - I love painting it up because it has that balance between level and detail and paintability! Very much looking into - it's great stuff and I think there will be lots more variety on offer. That is sweet! I'm gonna have to get one of these! It's a cool set! Glad you like it! Hmm, looks like quite an interesting kit. Fantastic work, I like how worn out it looks, really causes an impression. It's got a lovely post-apocalyptic / fringe world sci-fi feel, with some really nice detailing. It's fun to paint too! There's so much about this to like! You've done a lovely job setting the scene for this with the rocky backdrop and the cactuses. I particularly like the gate piece with blue and orange contrast. And the colour you've chosen for teh logs makes them look really sun-bleached and evocative. Thanks Curis! 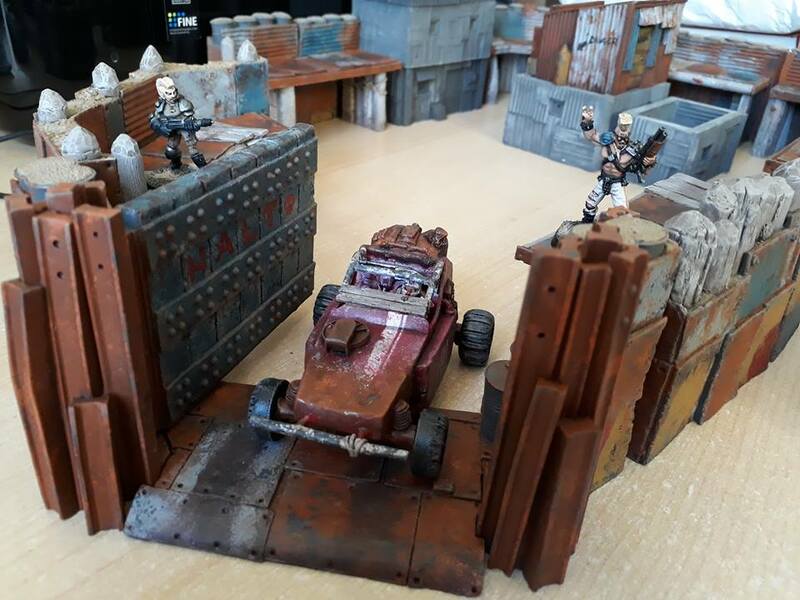 I actually started painting the gate with a mix of colours like the walls, but realised that wasn't going to have as much impact, so I started it again! That looks great! I got a chance to play on a table with a few of the Fogou buildings last month. They were pretty nice. Fogou stuff is really nice. Glad you like these! Looks great. I especially love the heavily rusted steel beams. I managed to not comment on this, duh. It looks lovely. Did you think any further about incorporating the shacks into the fort to make a town, or enough of a town for a photo? I do plan to add more shacks and scrap walls with a combination of Fogou and Crooked Dice pieces. Hopefully later this year.